Bethesda, Md. – June 27, 2016 – Marriott International announced the July 1 opening of the first Courtyard hotel in Nassau, Bahamas: the 112-room Courtyard Nassau Downtown/Junkanoo Beach. Formerly the Sunset Resort Nassau, the waterfront resort on the palm-fringed sands of Junkanoo Beach is located just a short stroll away from the cruise port, famous Cable Beach, excellent shopping and dining options and top local businesses. The hotel is managed by Urgo Hotels & Resorts and owned by Sunset Equities Ltd. 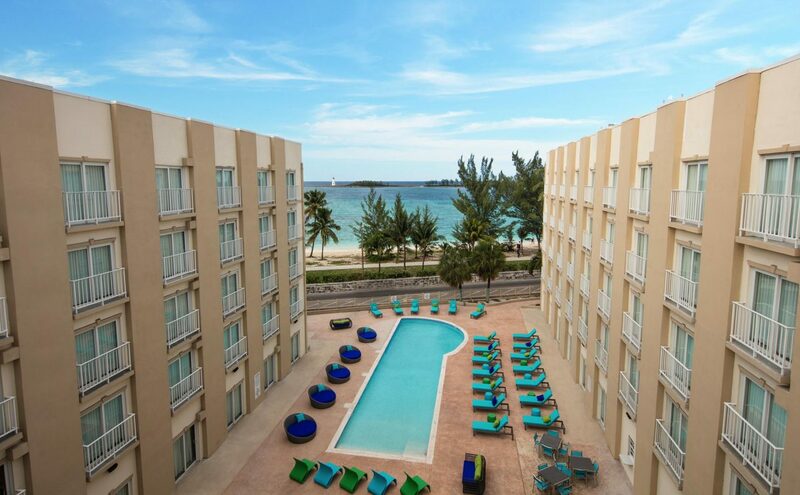 The five-story Courtyard Nassau is stylishly furnished with a distinctly Bahamian vibe and color palette. The spacious 112 guest rooms and suites feature luxurious bedding, modern lounge furnishings and large work areas, accommodating the needs of travelers of all types. The hotel also boasts a resort-style pool and sun deck, a fully equipped state-of-the-art fitness center, The Bistro, the brand’s signature restaurant is open for breakfast and dinner, and a lobby bar and lounge for evening cocktails. Complimentary high-speed internet is available throughout the property. The refreshing lobby concept is contemporary, open and stylish, with colorful, bright and welcoming spaces where guests can check e-mail, gather informally with colleagues or simply relax. Courtyard Nassau’s choice location near top local businesses makes it an ideal stop for business travelers. Its beachfront setting is equally well-suited for family reunions and birthday parties, and the resort’s well-equipped boardroom hosts 15 for executive meetings. Courtyard Nassau is located on West Bay Street, Nassau, Bahamas. Bookings can be made now, online or by phone, for stays as of Friday, July 1. For more information or to book a stay, call the hotel directly at 800-406-7910 or toll-free at 1-888-236-2427 or visit http://www.marriott.com/hotels/travel/nascy-courtyard-nassau-downtown-junkanoo-beach/. Courtyard by Marriott features hotels with refreshing environments that help guests stay connected, productive and balanced while traveling. Courtyard is constantly evolving to meet the changing needs of the guests. The latest guest room design offers hybrid spaces that accommodate all aspects of a guests’ stay. With more than 1,000 properties in more than 45 countries, Courtyard has the most locations of any brand in the Marriott International portfolio. For more information or reservations, visit www.courtyard.com or call Courtyard Nassau Downtown/Junkanoo Beach directly at 800-406-7910 or toll-free at 1-888-236-2427. Courtyard hotels proudly participate in the award-winning Marriott Rewards® frequent travel program that allows members to earn hotel points or airline miles for every dollar spent during each stay. Urgo Hotels is a Bethesda, Md.-based hotel company that develops, owns and/or operates 31 distinctive and unique hotels and resorts with an aggregate of more than 4,300 rooms in major markets and resorts in the United States, Canada and the Caribbean. The company develops, builds, and operates for its own account, and provides third-party management and asset management services. For more information about Urgo Hotels and Resorts please visit www.urgohotels.com.